Hi everyone. It's another raw and damp Tuesday, and a good day to have a nice BIG breakfast. Back in March the hubby and I tried a new place to eat a couple of towns south of us. We actually went in for lunch, but the breakfast looked so yummy we decided to have brunch instead of lunch. A chili cheese omelet, homemade toast and a cup of beans. So much food you had to roll m back to the car. 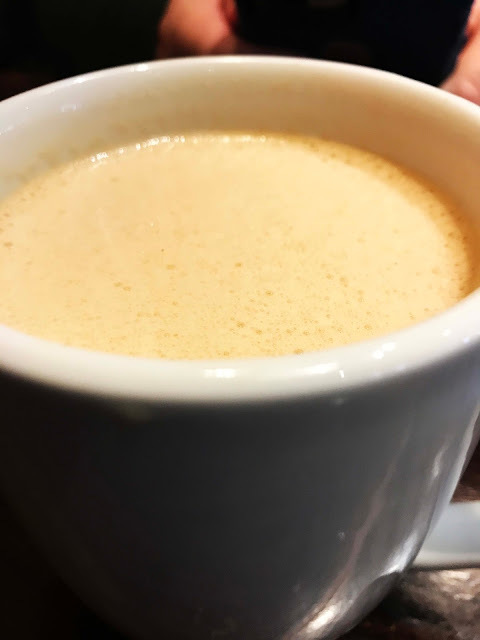 I decided to try a mug of their chai and boy was that a great cuppa of tea. I could go for one right now. 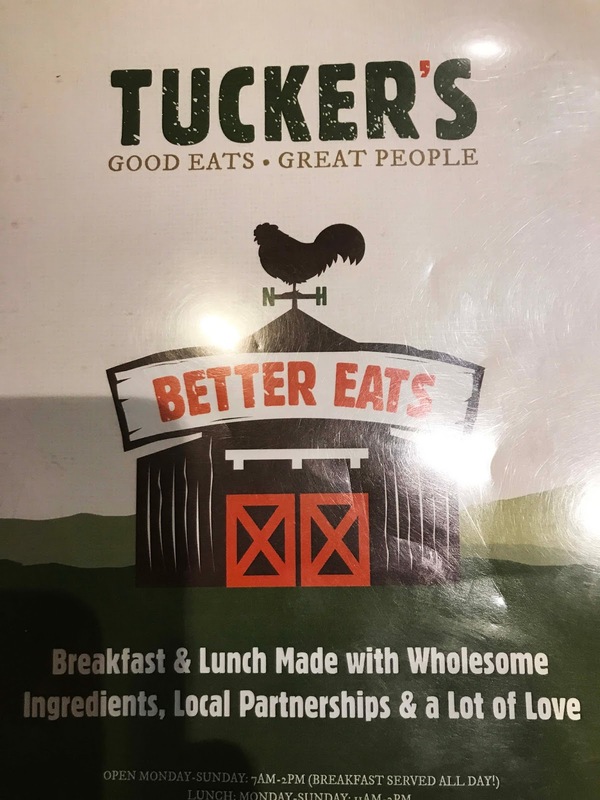 Tuckers is a small New Hampshire chain. They have a huge menu and I highly recommend it for anyone who might be in the area, although I know many of you are far away. I will go back sometime when I'm in the local of one of their restaurants. I'm joining up to Bleubeard and Elizabeth's blog for the T for Tuesday post. Time to share your drink related posts and we'd love you to stop by if you don't usually stop by. Running a little late this morning so if I don't stop by your blog now I will be by later today. That certainly was a substantial breakfast. I love Chai tea especially when its cold and dreary. I've tried it iced, but don't care for it that way. Heavy rains and water in the basement have given way to some sunshine today. Hope the sun gets up your way. Happy T Day! Now that is one hearty and delicious looking brunch, and your chai sounds so good too! All good for a chilly damp day like we are having so far today... happy T day! You are really lucky with the amount of great looking restaurants you have to choose from in your part of the world. This brunch looks yummy and so does the chai. Can I ask what the spread was on the toast, for me I usually have plain butter or with jam on mine. Your spread looked as if it was savoury. I really want that omelet. It looks delicious. So does your Chai tea. The toast looks yummy, too, but you can keep the beans (grin). I know your time is limited today, so I will say how happy I am you even found time to stop by and share your Chai, water, and wonderful breakfast with us for T this Tuesday. We never have beans with breakfast around here, but your plate opens me to the idea :) I like their dishes. Happy T Tuesday! I love brunch -- it keeps me going all day! Yours looks great! That's my kind of breakfast. It is closer to dinner time here at the moment but I think a chili cheese omelet would be delicious any time of day. Yummy! Especially the chai tea! take away the beans and i´m with you;) breakfast really is important for me, i could easier abstain from dinner than from breakfast! I love breakfast any time of day, and this looks very delicious! not used to baked beans for brunch though...but hey, why not?! we don't seem to have Tucker's in Ohio, but if you ever get a chance to try Cracker Barrel restaurant it's pretty good too! happy T day a bit late! I love Chai tea and I wouldn't mind this breakfast! Looks yummie! Bon Voyage dear Erika! Bring us many, many wonderful photos and stories! I am thinking of you for sure the whole time! 良い旅 - Have a good trip! That almost looks like a typical Mexican breakfast of huevos rancheros with a cup of beans on the side. The chili cheese omelet sounds yummy. I've gotten accustomed to beans with brunch. Great source of vegetarian protein. I hope your weather turns more spring-like soon!